“I haven’t been walking too far each day,” I told Dominic, my walking companion for the past two hours. “But you walk fast!” he said. “Well, in the mornings, yes. But in the afternoons, not really. And if there’s a climb? I go like this,” I said, slowing my pace, putting my head down, and taking small steps. He laughed. But soon enough we arrived at an ascent, and he took off ahead of me, as I expected. I also expected he’d be waiting for me at the top. Not because he was obligated, but because it’s what people do on the Camino. I first met Dominic that morning about thirty minutes after beginning my walk. 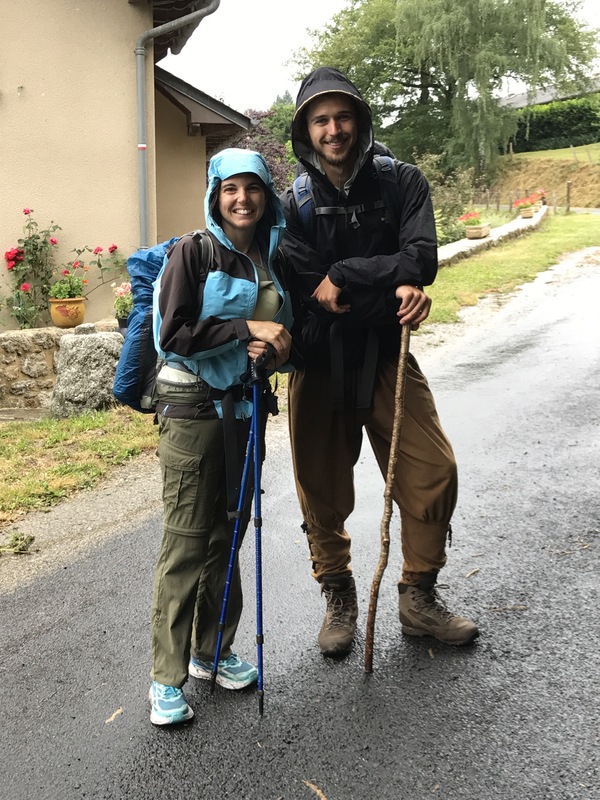 I learned he was walking all the way to Santiago de Compostela (about 55 days walk from where we were) and that he began in his home country of Switzerland. He was 24, had quit his job, and was on the Camino de Santiago to find work–work that he would enjoy. “And do you know what that would be?” I asked. “In a hostel or a bistro,” he said. “I love to cook.” I told him about the hostel in Madrid–where I’d stayed three weeks ago–that was both a hostel and a cafe. “It combines both of your interests,” I told him. But he has bigger plans: to open a hostel where young people could work for a spell to save money to go traveling. A man after my own heart, I thought. After the getting-to-know-you portion of our conversation, we came upon a WC (water closet) in the woods. The French have done an excellent job of building environmentally-friendly “dry toilets” along this route, complete with pictures on what happens to the waste. I indicated to Dominic that I was going to stop, and said maybe I would see him soon. I’d just met him and didn’t want to slow him down. I came out and he was gone, but after walking a few minutes I saw him at the top of a hill, waiting for me. So I wasn’t surprised when I got to the top of the next hill and he was waiting once again, this time smoking a cigarette beside a sign welcoming us to the town of Senergues. In the few minutes he had waited, he’d met three French women who were resting there. They were walking to Conques today, the end point of their journey, and encouraged Dominic and I to spend some time in that city when we got there. “I think I will,” Dominic said. “My feet are hurting and maybe I need to rest.” At this, one of the women motioned toward her backpack while giving a command in French to her friend. The friend unzipped the pack and produced a small brown plastic jar. “Here,” the woman said, handing the jar to Dominic. “Creme pour pelerins,” it read. Cream for pilgrims. “Put this on your feet tonight. Massage them. Then do it again in the morning.” She explained that she was finished and wouldn’t need it anymore. Dominic thanked her, a little surprised. I smiled at being able to witness the generosity of pilgrims. And as I write this I realize that it was karma, really. Dominic did a kind thing by waiting for me. Multiple times. If he hadn’t, he may never have met the woman with the cream. He may have just walked by them with a greeting instead of stopping for a chat. After lunch together, Dominic and I said our goodbyes. He was walking on. I, however, had a researvation at a gite in the this town. I don’t know that I’ll ever see him again. Perhaps he will walk quickly enough that he will make it to San Anton while I am there. Perhaps not. Either way, I know we will both continue to be blessed by the generosity of pilgrims.